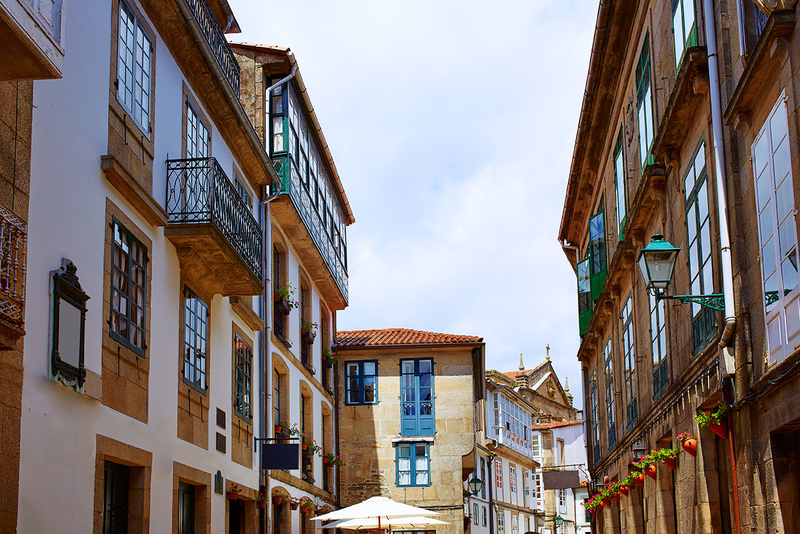 Casa do Medio is located in San Pedro neighbourhood, a neighbourhood that represents the essence of the town like no other (in fact, it has already been referred to as “Compostela’s Soho”). Tradition and modernity coexist in perfect harmony in its streets, many of which are pedestrian-only; a combination that can be easily seen in its rich variety of shops, its appetising restaurants, its multiple cultural expressions (or rather, multicultural) and its famous popular festivals. Actually, San Pedro festival (at the end of June) is a not-to-be-missed event for locals and visitors. Casa do Medio is less than 100 metres away from the Centro Galego de Arte Contemporánea (Galician Centre of Contemporary Art) and the Museo do Pobo Galego (Museum of the Galician People), located in the old and emblematic Convento de San Domingos de Bonaval (Monastery of Saint Dominic of Bonaval). It is also less than 200 metres away from the beautiful Plaza de Abastos (the local marketplace), the second most-visited tourist attraction after the Cathedral (just a 10 minute walk away from Casa do Medio apartments). The old town of Santiago de Compostela was inscribed as a World Heritage Site by the UNESCO in 1985 due to the beauty of its heritage, its remarkable state of conservation and the fact of being the final destination of the Way of Saint James. Its impressive wealth of monuments – the most important one is one of the most beautiful cathedrals in the world – coexists with different examples of contemporary architecture created by some of the greatest architects of our time (Siza, Eisenman, Hejduk). The town spreads out its neighbourhoods along a beautiful and well-tended network of green areas combined with unique charming squares, streets and alleys that are constantly walked by locals and tourists. This multiculturalism is also visible in a varied and appealing network of museums, as well as in the countless cultural and festive manifestations that take place in the capital of Galicia throughout the year. Its original and lively range of shops, its gastronomic choice, in which tradition and modern cuisine are combined with the best products, and its hospitality will captivate those who have never visited Santiago de Compostela and will captivate again those who already have.